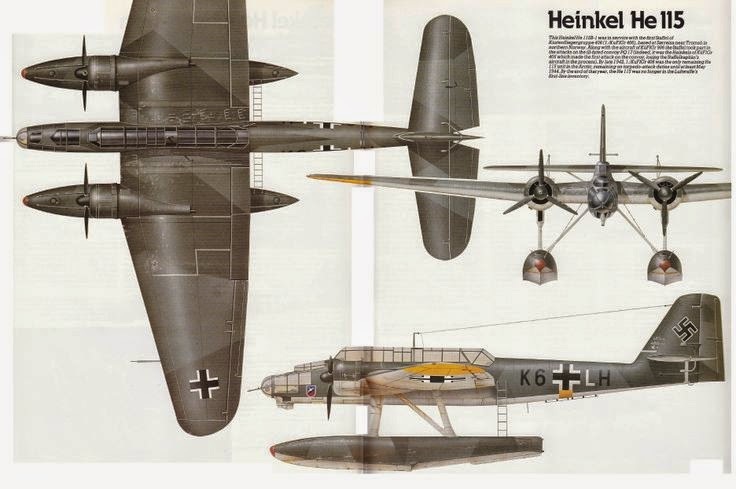 The Heinkel He 115 was the Luftwaffe’s most versatile floatplane reconnaissance craft. It performed so successfully that production was resumed in midwar. In 1936 the prototype He 115 was flown as the successor to the aging He 59. It was a standard, allmetal, midwing monoplane whose broad wing possessed tapering outer sections. A crew of three was housed in an elongated greenhouse canopy, and the craft rested upon two floats secured in place by struts. The prototype was fast, handled well, and quickly broke eight floatplane records in 1938. Such impressive performance resulted in orders from overseas, and both Norway and Sweden purchased several machines. The He 115 also entered production with the Luftwaffe Seeflieger (coastal reconnaissance forces). In 1939 the B model appeared, featuring greater fuel capacity and reinforced floats for operating in snow and ice. When World War II commenced, the He 115s partook of routine maritime patrolling and mining of English waters. They were the first German craft adapted to drop the new and deadly acoustic sea mines from the air, which inflicted great damage upon British shipping. They also proved quite adept at torpedo-bombing and as long-range reconnaissance craft. Curiously, the 1940 invasion of Norway found He 115s closely engaged on both sides of the conflict. The six Norwegian machines put up stout resistance, with three survivors and a captured German machine escaping to Britain. These were subsequently given German markings and employed for clandestine operations ranging from Norway to Malta. These activities were subsequently suspended after 1943 for fear of attacks by Allied aircraft. The high point of He 115 operations with German forces occurred in 1942, when they shadowed ill-fated Convoy PQ-17 in the Arctic Circle and assisted in its destruction. Production of He 115s ceased in 1941, but their services were so highly regarded that it resumed in 1943! A total of 450 machines were built, and most performed capably up to the end of hostilities.